Mastering Prezi for Business Presentations, by Russell Anderson-Williams, has just been released by Packt Publishing. I have an interest in this, because I served as one of the two Technical Reviewers for the book. 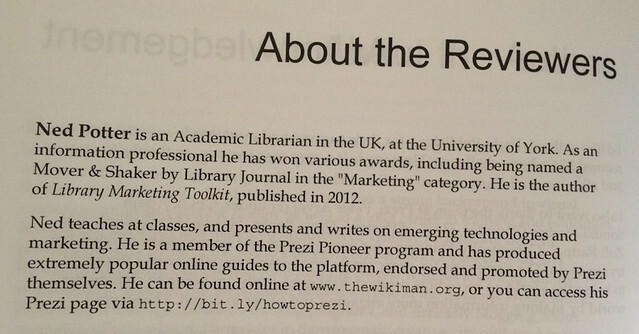 Check it out, I even get a little bio in there! As the name suggests the book is aimed at people giving business presentations - but basically all of it is applicable to anyone wishing to progress their Prezi skills to the next level. What I really like about it is it's written by someone from a proper design background, so there's a lot of technical stuff which is really handy if, like me, you quite like designing multimedia things but have no real idea what you're doing. The sections on using audio and video are really good, and Russell certainly knows a lot of tips and tricks which were new to me. He really gets to grips with the potential of the software, and it's very engagingly written. The way the process works with this particular publisher, is that they send you each chapter basically as soon as it has been written. You're encouraged to use the comments facility of Word to go into as much detail as you can, suggesting changes and improvements or highlighting the bits you think work really well. There's also a questionnaire for each chapter, which includes questions like 'what do you think the next chapter should be' and so on. You send back the chapter and the questionnaire, they pass it on to the author along with the other reviewer's comments, and then you get sent the next one or two chapters once they're done. It's an odd process because you want to be doing a good job as a reviewer and actually making constructive suggestions, so you want to add as many comments as possible - but at the same time you don't want to be finding fault where there is none, and the fewer comments you make the more complete the chapter is already, which is a good thing. So the balance is a hard one to find. I was doing this around the same time I was finishing off my own book, and I have to say I would have found it very difficult to work like this - showing people what I'd done as I went along. I'm the kind of person who likes to have anything creative more or less complete before showing anyone - and that includes having all the chapters drafted, for context! Facet asked for one chapter early on in the writing process (to check I could actually write) but then let me get on with it thereafter till it was a completed draft. At this point they said they could send it off for proofing, indexing etc - or they could get it reviewed. I asked for it to be reviewed, and specifically asked if Antony Brewerton could review it; I'm really glad I did as the extremely helpful comments he came back with led me to actually restructure the book quite significantly, moving content around and adding some stuff in. All in all reviewing this Prezi book was enjoyable. Sometimes I found it hard to turn around the work in the time the publisher wanted, and I never really had a sense if what I was doing was actually useful - I asked for feedback but I was told they'd be in touch if there were any problems, so hopefully that means there weren't any. The best part of it was definitely getting to read a great book! There are loads of really useful tips I've adopted, and my recent Prezis are much better than my earlier ones because of it.